My maternity leave is on the not-so-distant horizon (it officially starts Wednesday!) 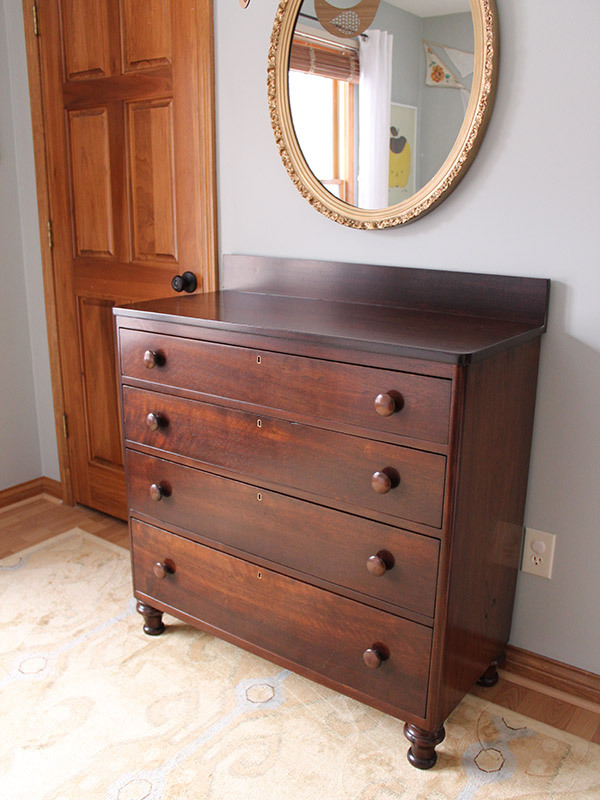 and with my workload returning to a manageable level I can finally get around to showing you guys the dresser makeover! 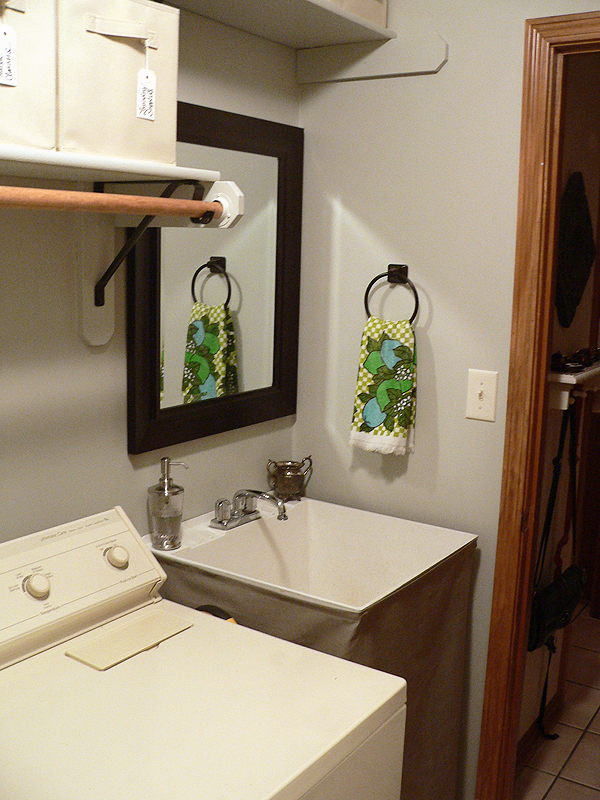 I didn’t want to rush through this post, when the time came to do it, because this is one of the few projects for our home that has taken so much blood (Steve’s), sweat (Steve’s), and tears (mine — happy tears). 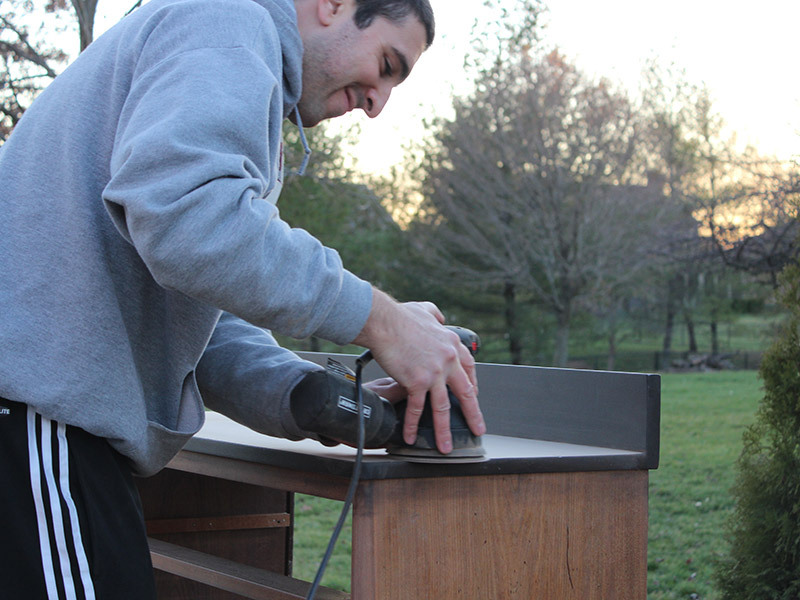 Sure, it’s taken us a long time to build furniture in the past, but I can’t think of another project that has been so near and dear to our heart. 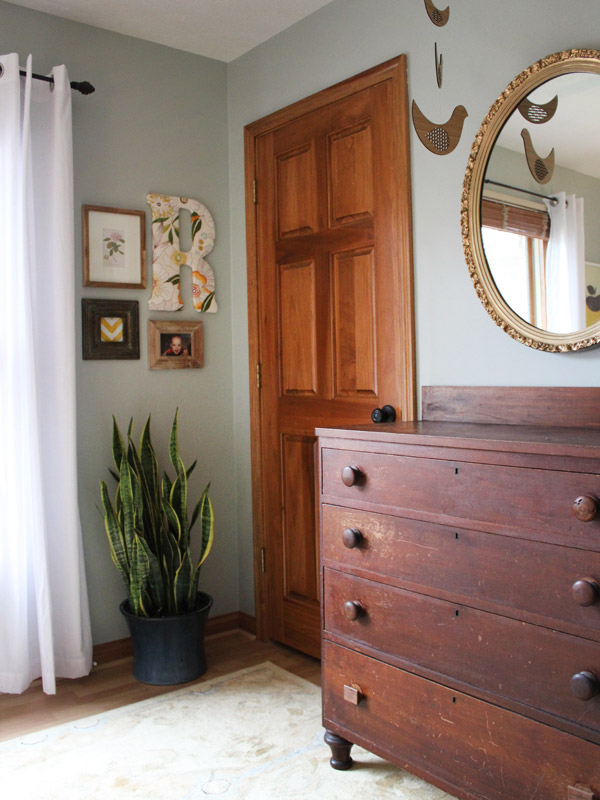 When I first mentioned that we were going to refinish this dresser, a hand-me-down from Steve’s parents that has been in the family for decades, a lot of you said you liked the distressed look. 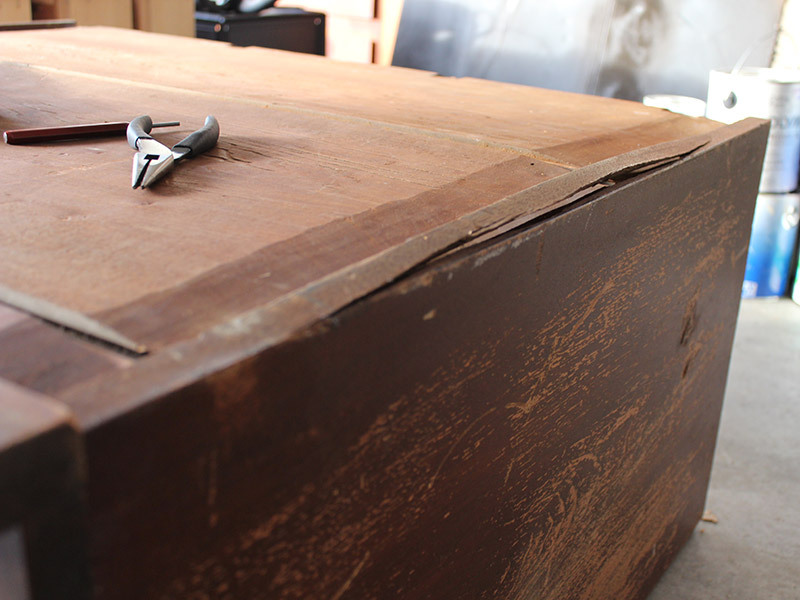 And I do, too — don’t get me wrong — I adore a handsome piece of worn furniture. 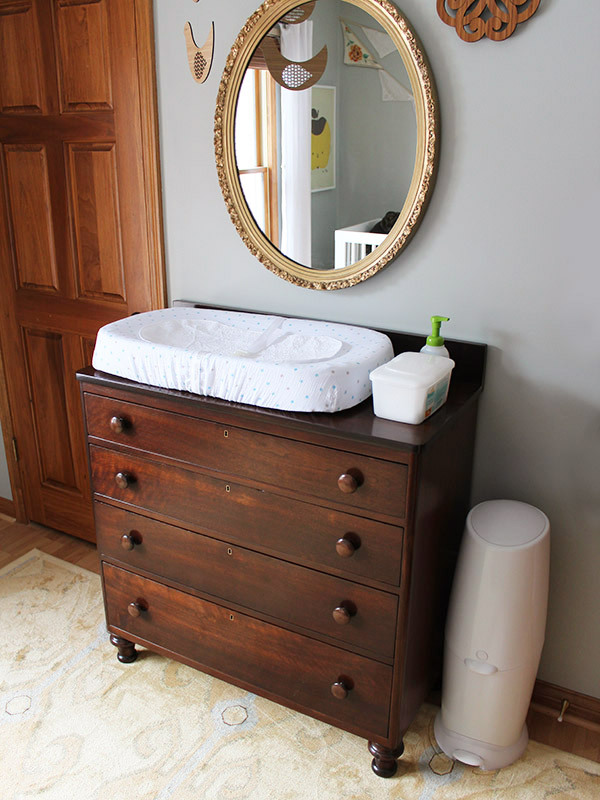 This dresser wasn’t so much “distressed” as it was “completely falling apart.” That wasn’t going to cut it for our baby’s changing table. I needed to know with 100% certainty that my little girl’s tushie would be wiped clean on top of a sturdy piece of furniture. Steve got to work. 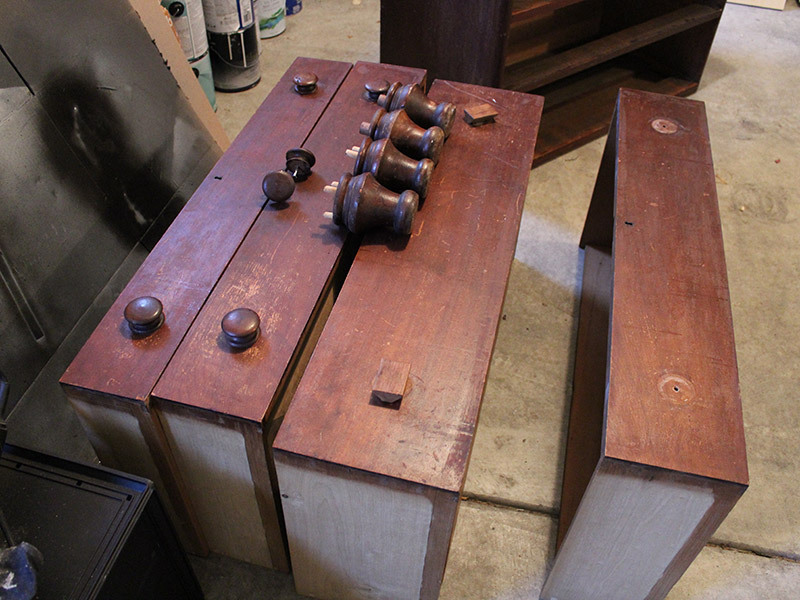 The feet were all removed (they were all wobbly and needed to be re-glued) and the mismatched knobs were tossed. 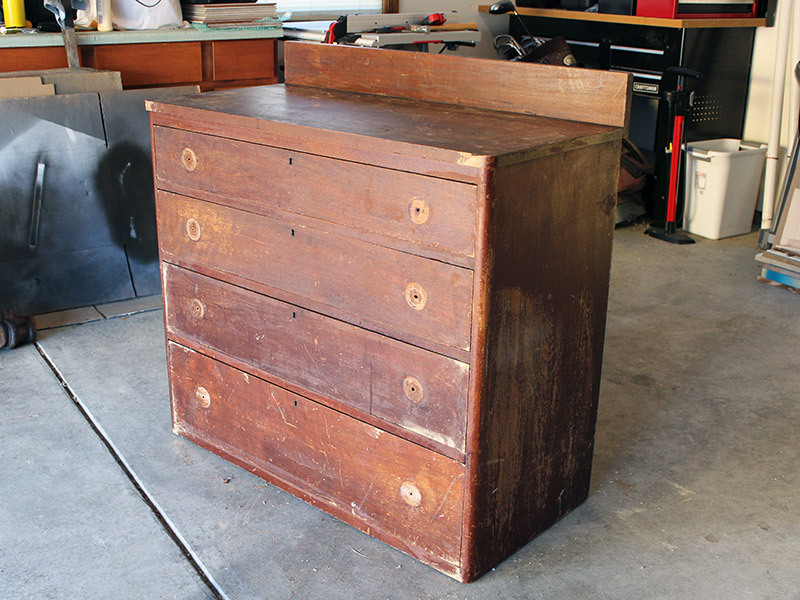 Luckily our love for this dresser allowed us to see through the deep scratches. 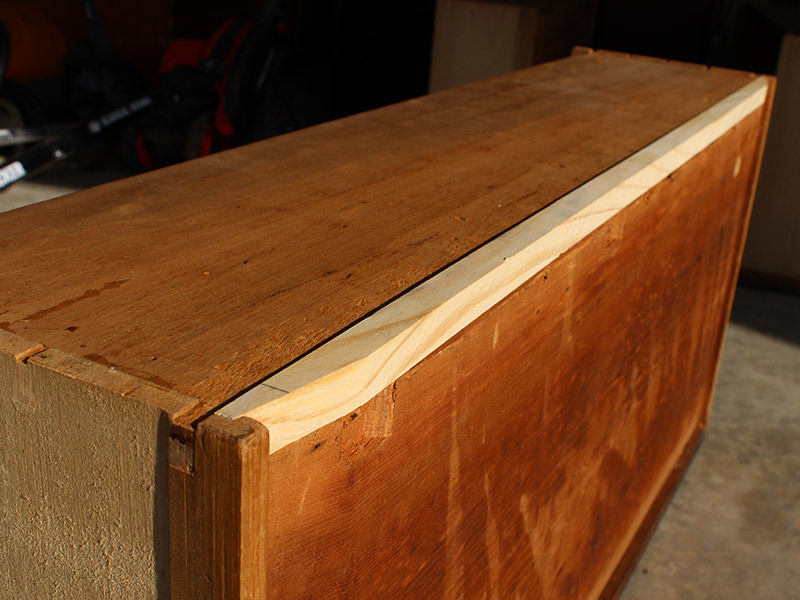 With dovetail-jointed drawers and solid wood construction, we knew we were dealing with some mighty fine bones. 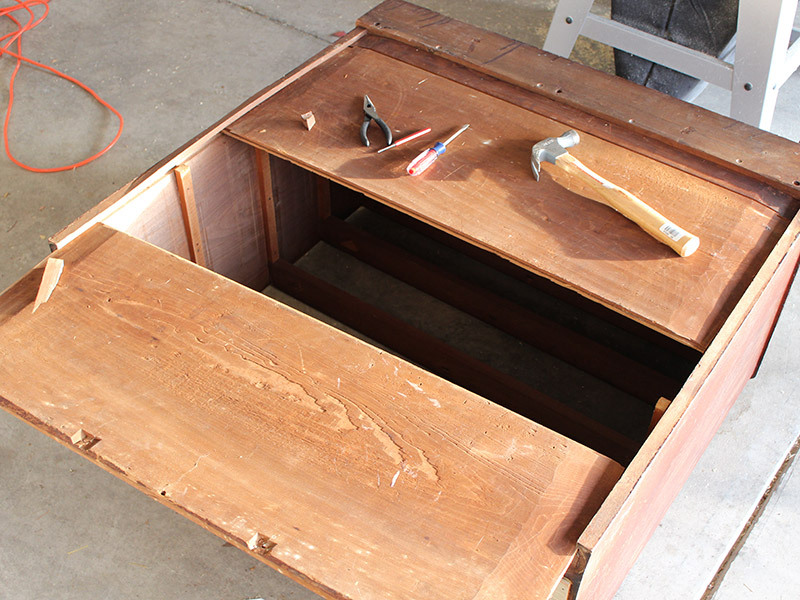 The first thing my handsome lumberjack tackled was addressing the huge gaps inside the drawers. No one likes a drafty drawer. It would’ve been easy for diapers and clothes to slip through the gaping holes. Seems pretty simple, but those suckers fit perfectly, now. 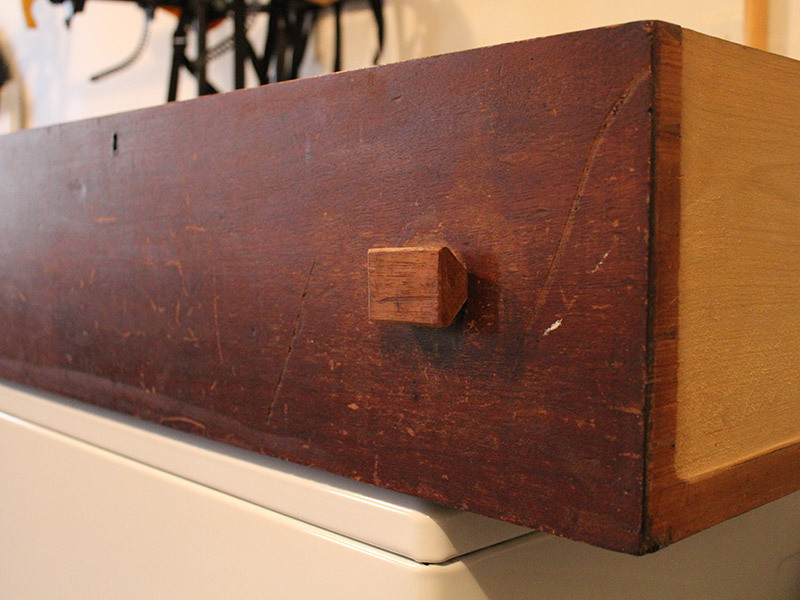 They didn’t need to be stained since they aren’t at all visible when the drawers are in use. 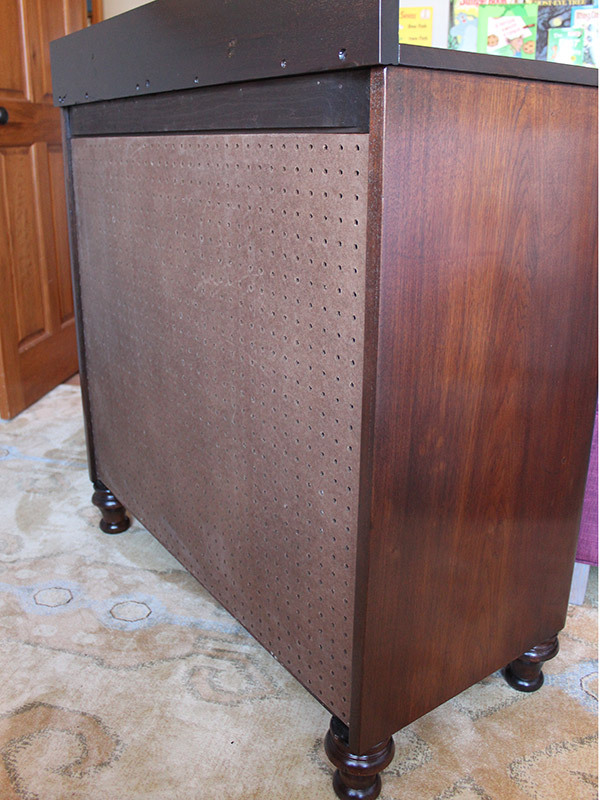 Next on the agenda was fixing the entire back of the dresser, which was splitting and splintering under the pressure of an ill-fitted backboard. When he removed the backboards he discovered the slots where these were supposed to easily glide were completely split and falling apart. Nothing a little wood glue and a few days of clamping couldn’t fix. Awesome. 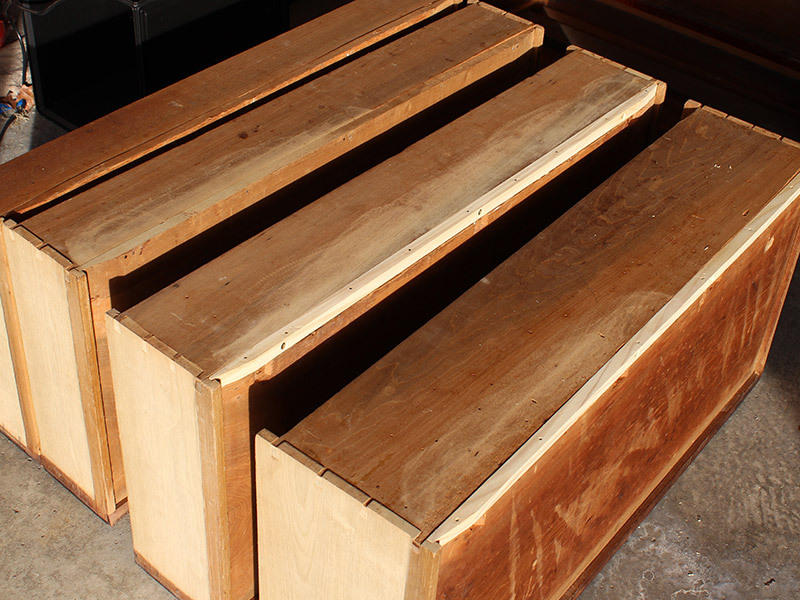 So, after that was fixed he discovered another lovely secret –this dresser was full of them. 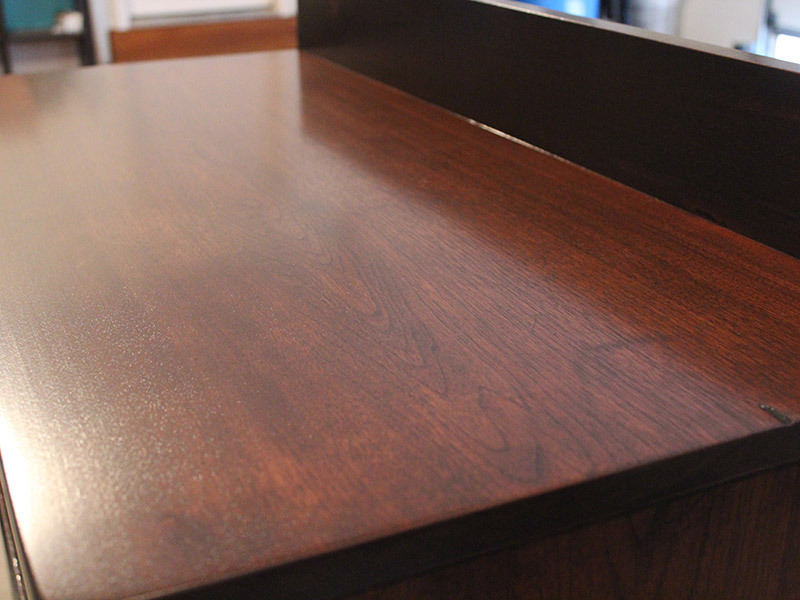 Once the drawers were back in place, he realized they overlapped where the imaginary backboard would go. 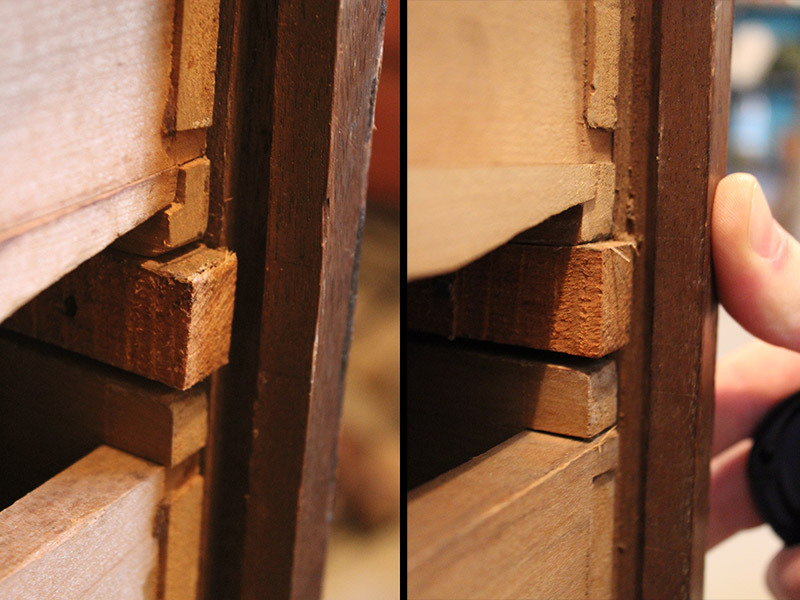 Below is a before and after of how he had to cut the drawers down. 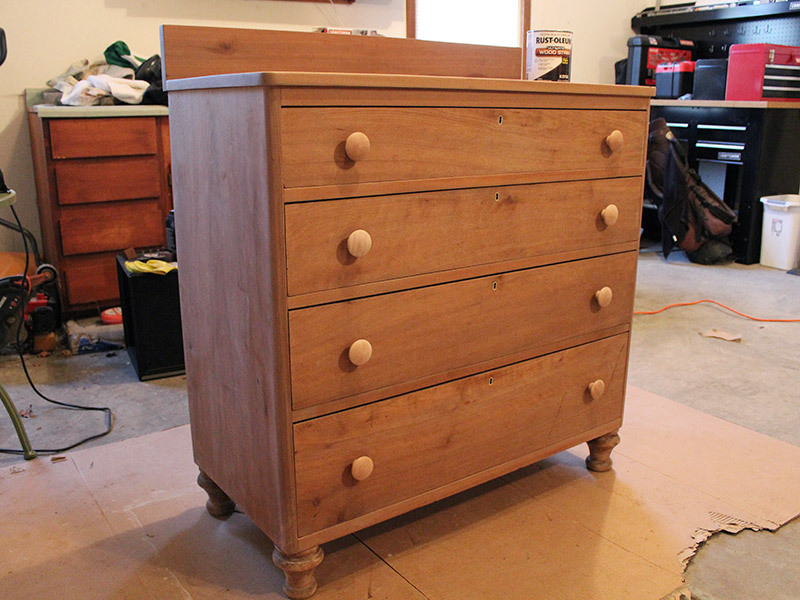 On the left, the too-long drawer, and on the right, the trimmed and handsome and no-longer-a-problem drawer. A week had passed and we finally had a structurally sound piece of furniture. 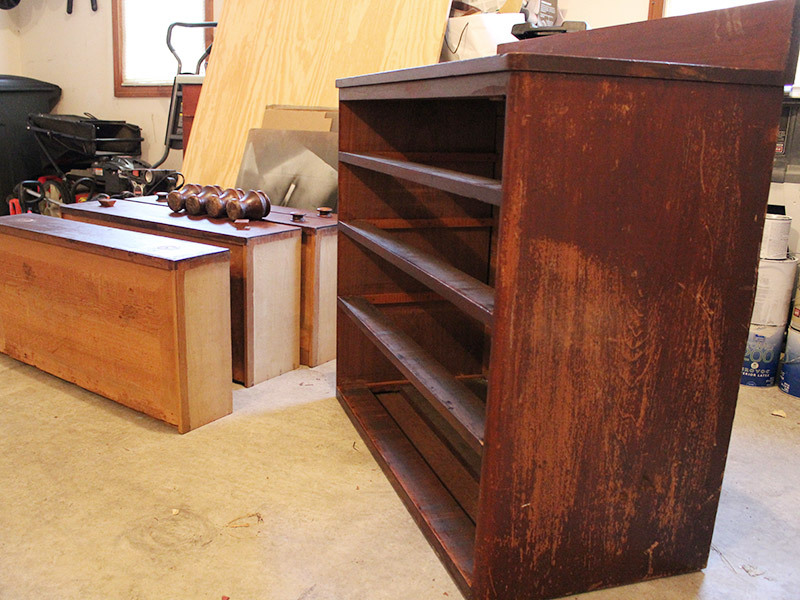 Now onto the next phase: stripping, sanding, and staining! 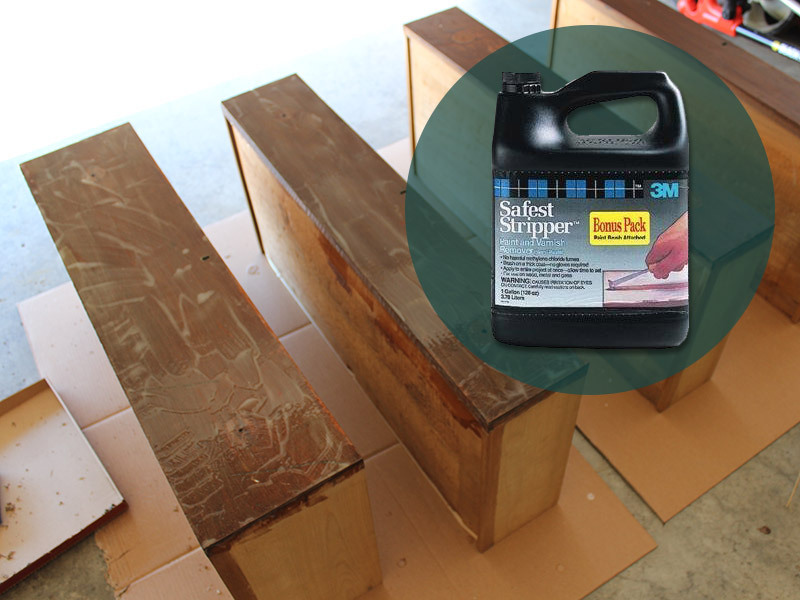 No, this is not a sponsored post — but I did want to tell you what stripping agent we used. 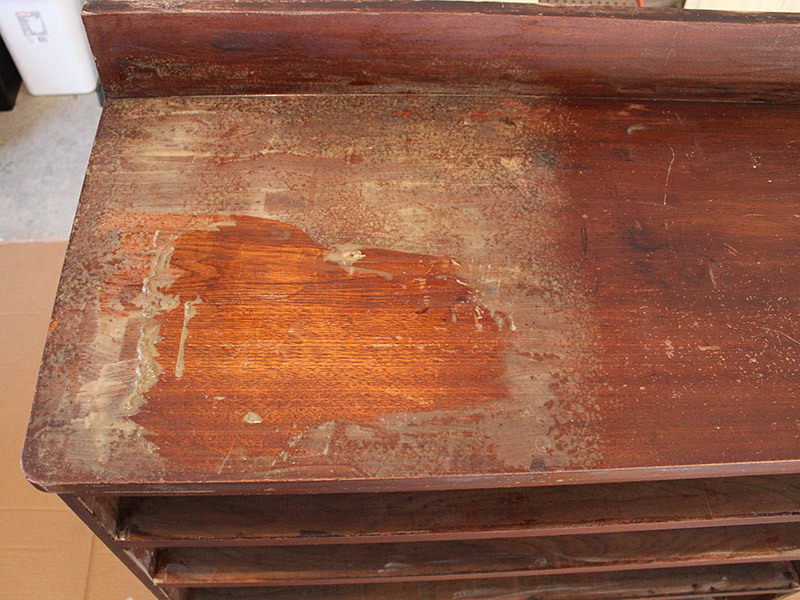 3M “Safest Stripper” was really a lifesaver on this project — there’s no way we could’ve just sanded this stain off. It was old and gummy, and it would’ve completely ruined our sandpaper and sanders. The only solution was to strip it. I made it through that entire paragraph without making a stripper joke. I would just like to point that out. This stuff isn’t an easy fix, though. There was a lot of gooping it on, waiting for it to absorb, and then wetting it to scrape it off. 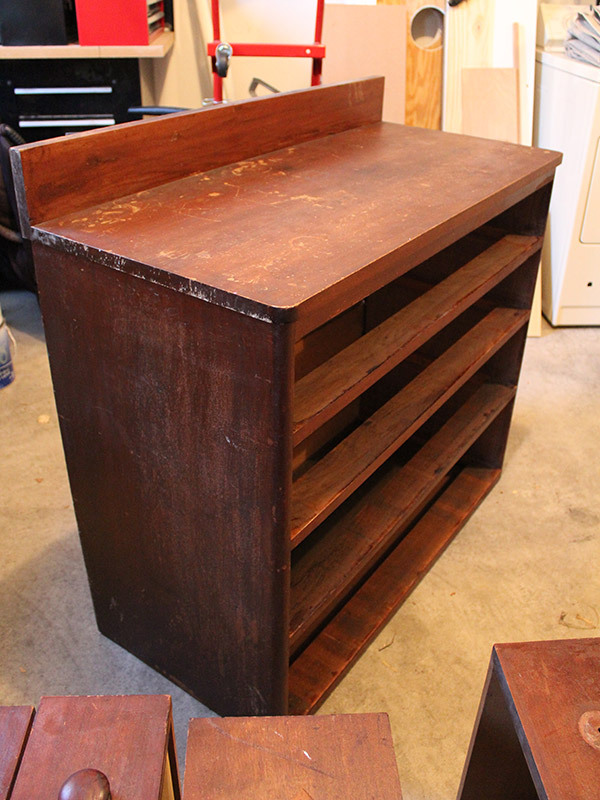 The entire process of stripping off the old stain took about a week. Isn’t it amazing how different the wood looks after it’s naked? I suppose we’re all like that, though, right? It’s like we stripped off the spanks and were pleasantly surprised! 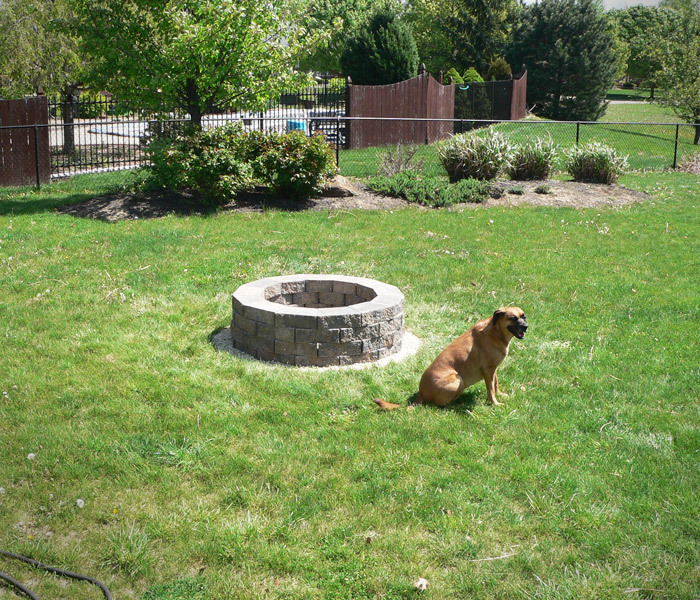 Here are a few more photos of the actual stripping. Again, no stripper jokes. Please for the love of god somebody virtual-high-five me. 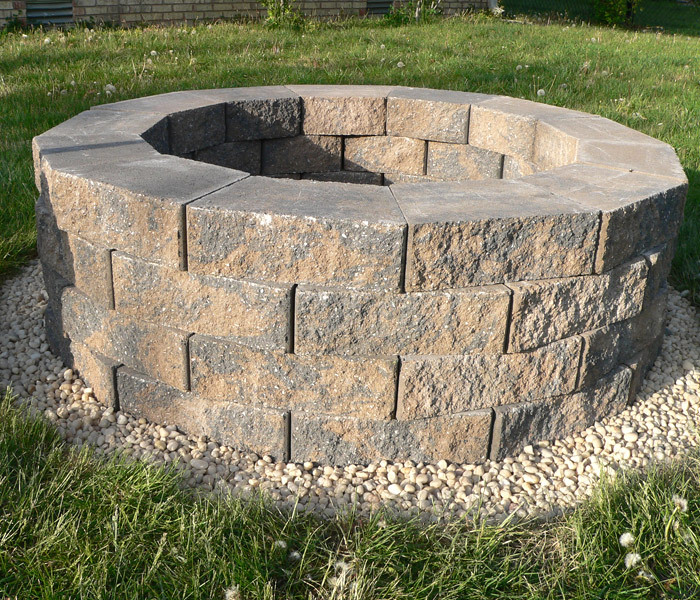 Doesn’t that just look like a completely different piece of furniture? A noteworthy tip: Steve used wood glue all around the edges of the pegboard to ensure the pressed pieces don’t ever come apart. 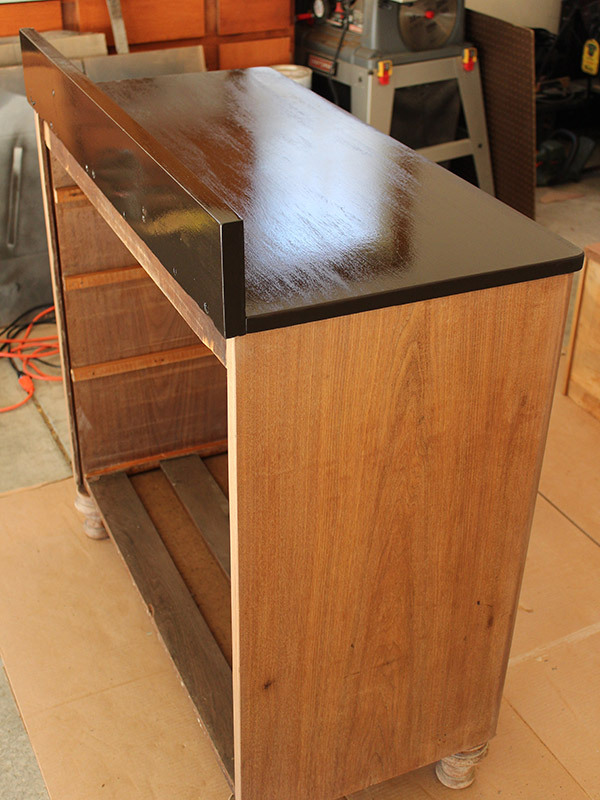 After the days of sanding it was time for stain. 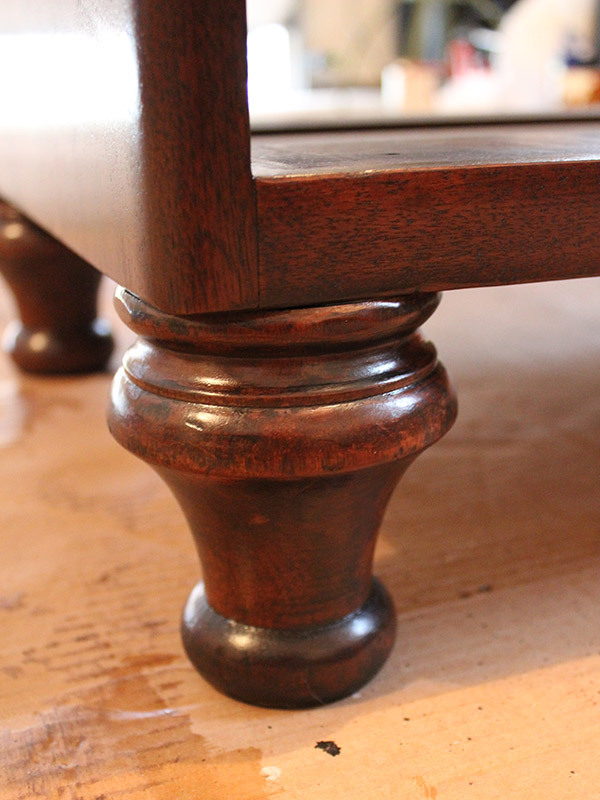 He put the first layer on and realized that he had some gouges in the wood that were very evident once the stain was in place. If you’re using a belt sander, sand WITH the grain. This seems like a no brainer, but don’t even go at the slightest, teeny-tiniest angle. Lesson learned. 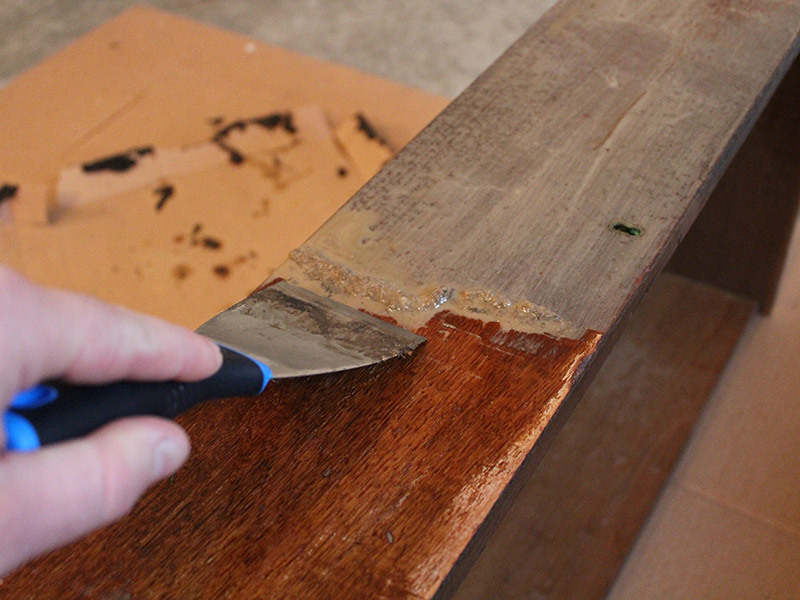 Don’t go directly from really rough to really fine sandpaper. Take the time to use a few in between grits. It’s totally worth it as it will gradually smooth the surface to perfection. Yes, he always sands at sunset with an adorably mischievous smirk. And then he stains like a boss. It’s totally hot. Oh, and yes. He also polyurethanes like a pro. Don’t you want to lick it? Or at least just press your face all up on it? A close up of the feet. I love the feet. And now, the moment you all have been waiting for (or at least the moment I was dying for during this entire process)… THE FINISHED PRODUCT! Isn’t she GORGEOUS? The variations of color in the rich, espresso stain just do it for me. It’s even prettier in person if you can believe it. 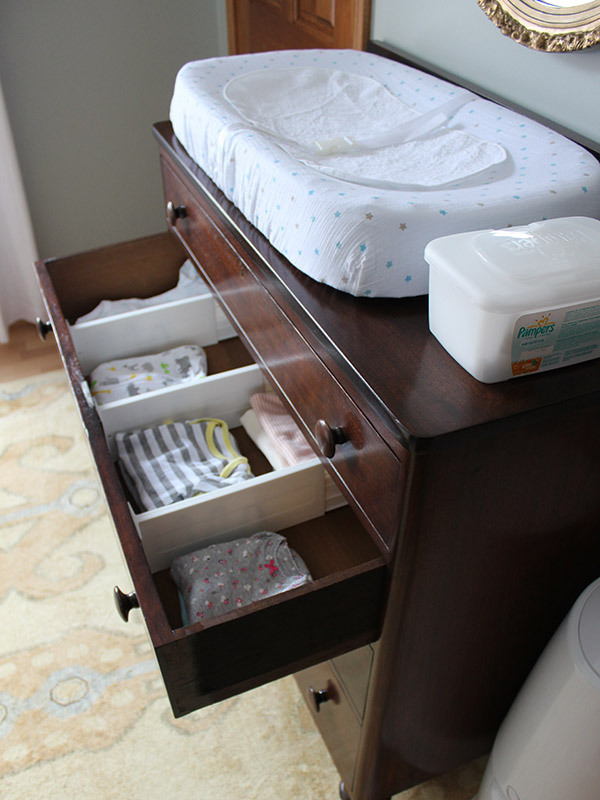 We added some drawer dividers, and yes I already know this dresser will most definitely not stay this organized once this baby makes her grand entrance. A lady can dream, okay? Can we just take a moment to fawn over this sweater my mom and dad bought for our little girl? 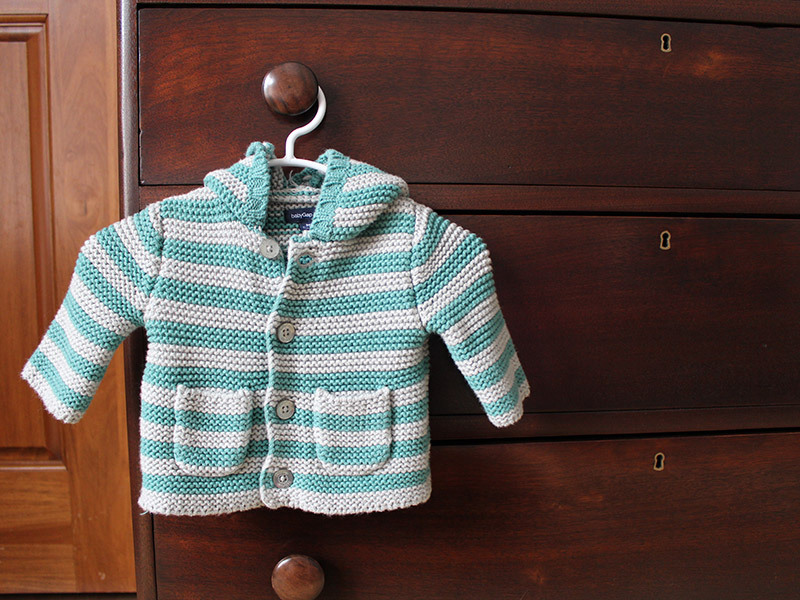 Sometimes I wander into her nursery with the sole purpose of opening the closet door and adoring her tiny clothes. Is that creepy? THEY ARE JUST SO TINY AND SWEET. So, what do you think? 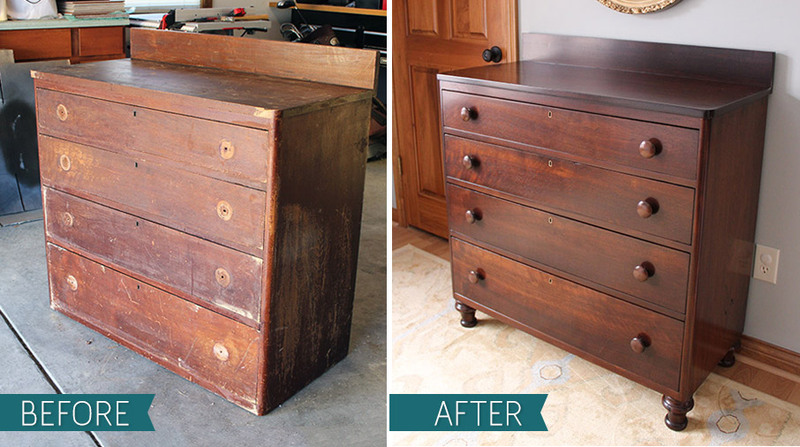 Vast improvement from the original dresser, right? 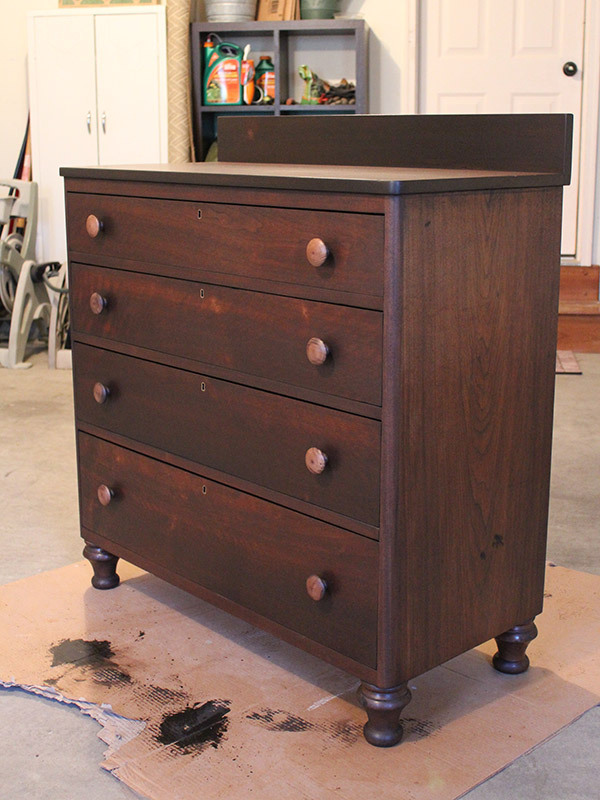 The coolest part of this project is although it took us (HAHAHA J/K I mean Steve) three weeks from start to finish, this dresser has been fully restored and can now continue to be passed on within our family. Don’t you think for a moment that he’s not going to make our little girl appreciate all the hard work and time he put into this project. I’m sure bedtime stories will consist of her listening to papa tell the tale of how he rebuilt, stripped, sanded, and stained the dresser that she will be sure to cherish until the end of time. Sigh. I can’t wait to tell her bedtime stories. We’re getting so close! 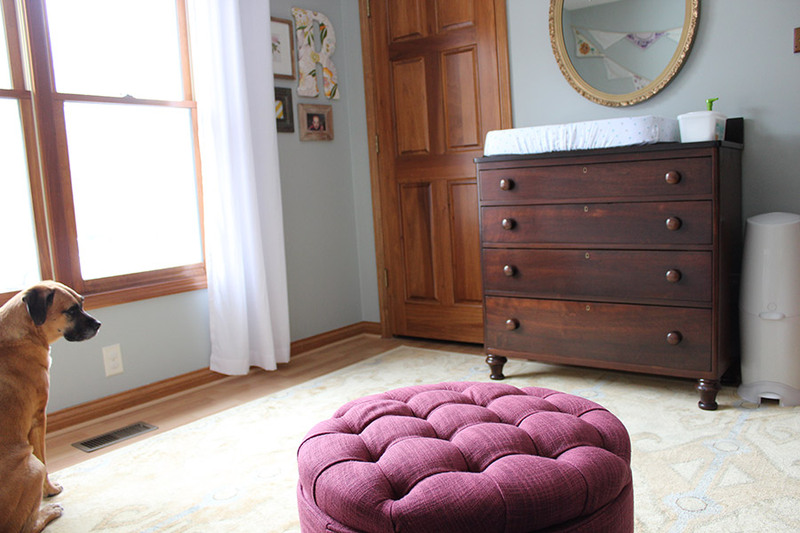 This entry was posted in Before + After, DIY - Built projects, Nursery Progress by mojo. Bookmark the permalink. virtual High Five for sure. You even showed the finished “back-side” without a stripper joke!!! I’m so proud of you! Oh and Steve too. 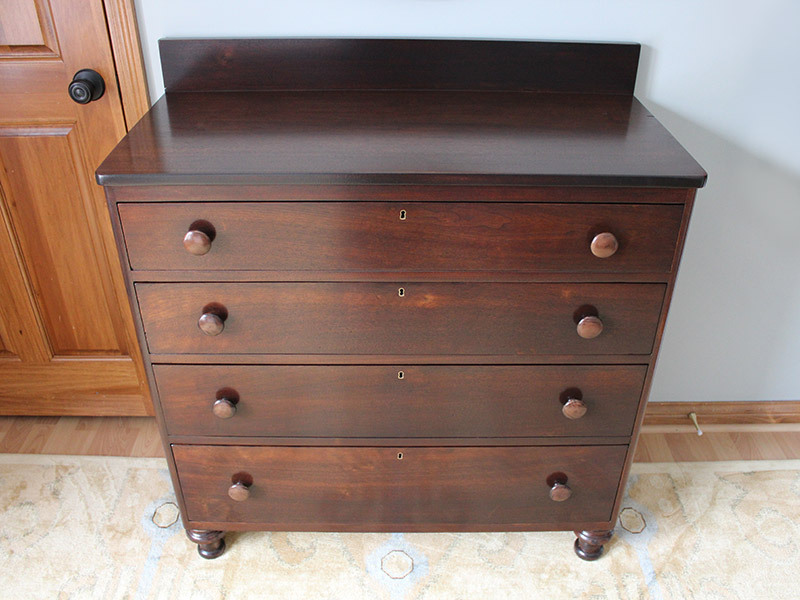 This post IS about the dresser, not strippers. I really liked the look before but the after is stunning! Bravo! Well done, Mr Lumberjack!!! High fives to Mrs Lumberjack, too. Your virtual friends cannot wait for little R(ebecca?) to make her grand entrance! Beautifully done! I’m missed you! Glad to have you back. Oh my gosh this is absolutely stunning! I love it! 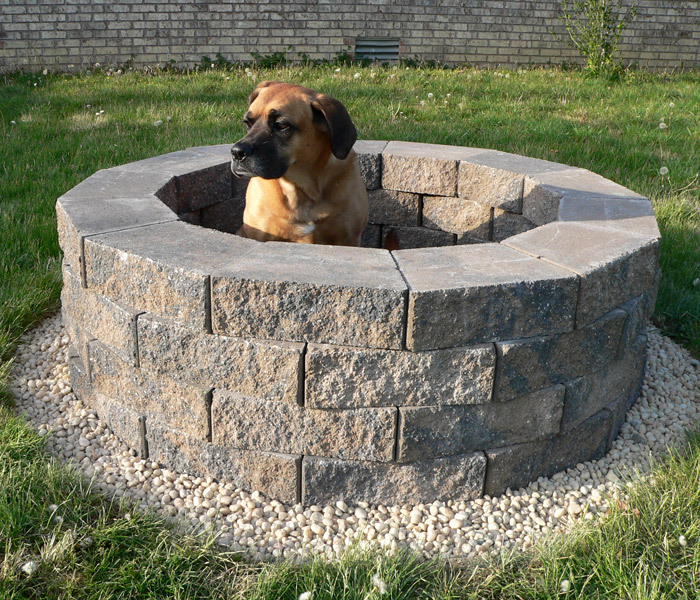 can you tell me how you put the poly on? Spray or roll? thank yoU!! 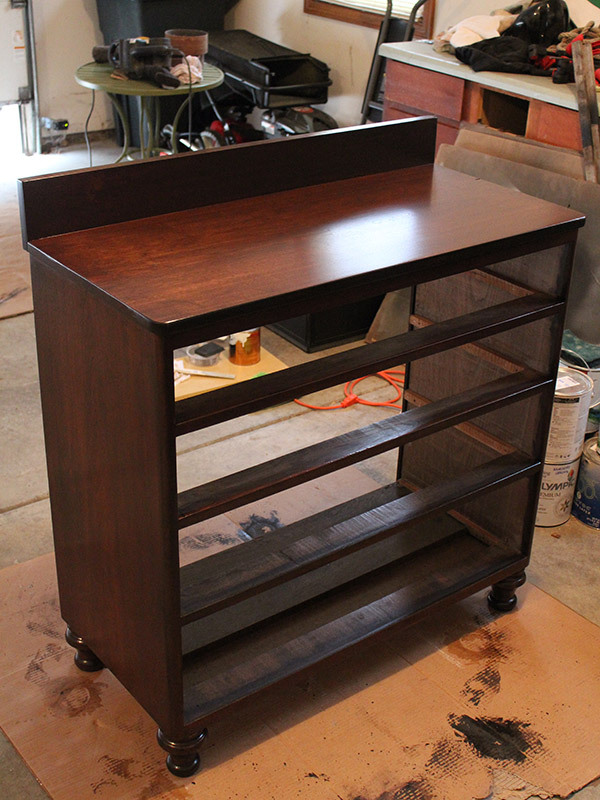 Can you tell me what color stain and what name brand stain you used on this project? 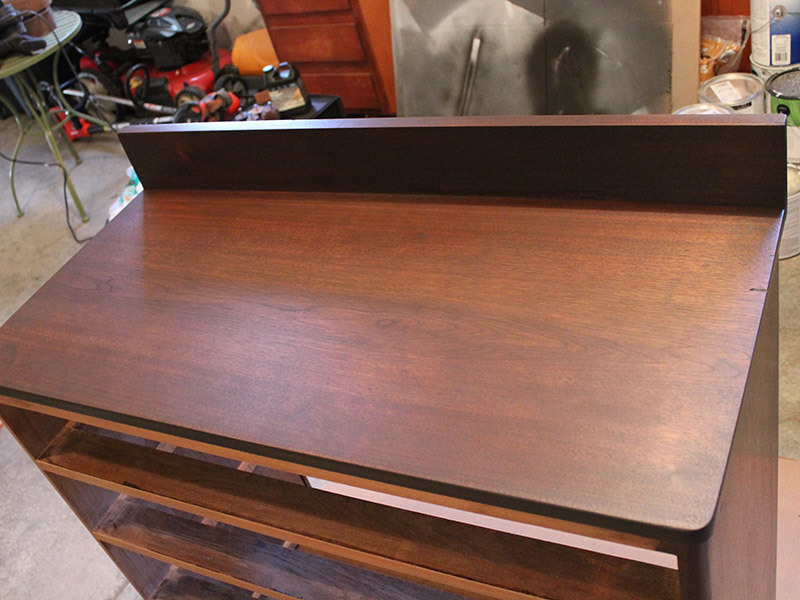 I am having a hard time comming up with a stain color for my Desk top I’m making. That is absolutely gorgeous!! the wood just sparkles! Thats amazing, can you give the name and color of the stain? Fabulous job. 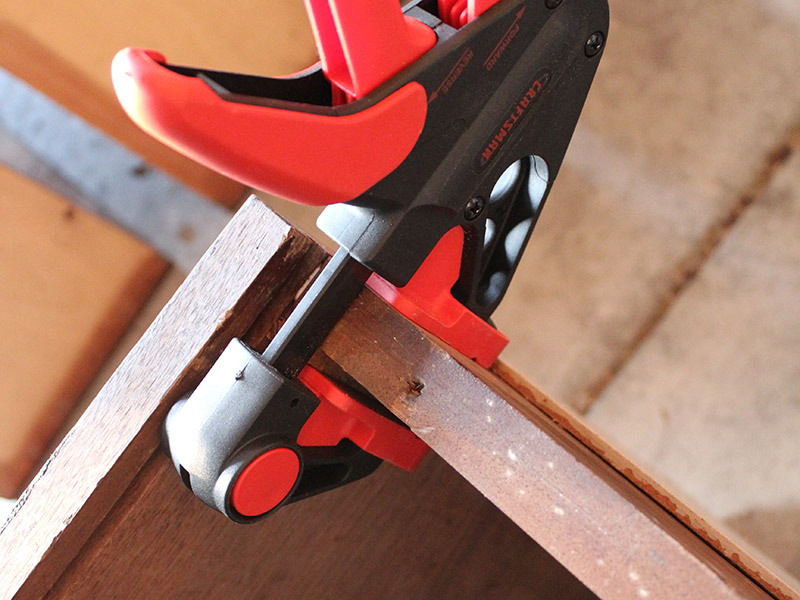 Why the pegboard instead of plywood? Thank you! A lot of the plywood we found was wobbly and not very straight, and also was very splintery. 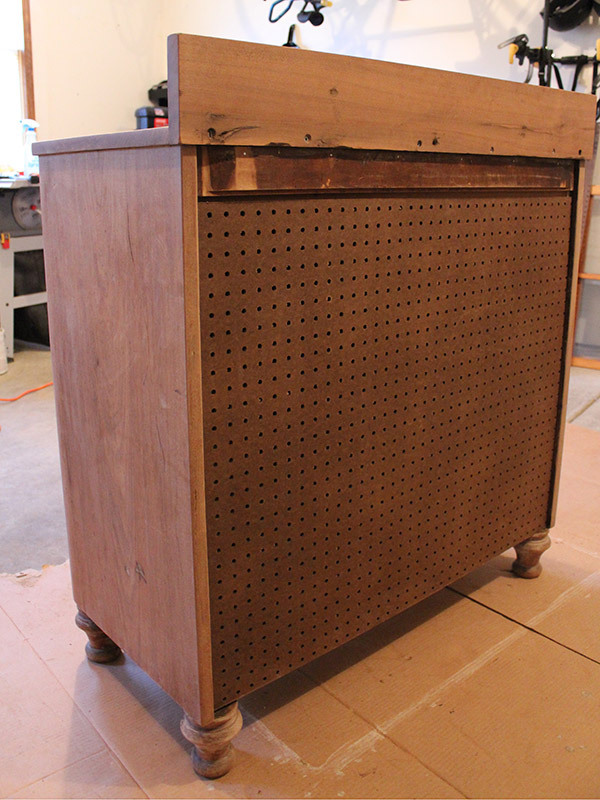 The pegboard, although filled with holes, was nice and sturdy, and had smooth edges and finish — meaning we didn’t have to sand or finish any additional pieces.